Low prices. OrangeSmile.com offers car hire service in Bahamas on the lowest-rate-guarantee basis, since we work with car suppliers directly. For your search criteria in Bahamas, we always select and show the best rental offers. The car reservation process consists of 3 simple steps: (1) search for available cars for your dates in Bahamas; (2) select your car type; and (3) fill in the booking forms. Once the reservation is completed, you will receive a confirmation voucher to your email address. During the booking process, please check your rental conditions. To pick up your car at the rental point in Bahamas, you need to provide our confirmation voucher, your driving license and a valid credit card. The final payment is normally carried out at the pick-up point. Our car hire points in Bahamas accept VISA, MasterCard, etc - please check your rental conditions. At the pick-up point, please read the handling manual and check the car for present defects. OrangeSmile.com wishes you a pleasant journey to Bahamas! The car hire reservation system OrangeSmile.com allows renting a vehicle in Bahamas within 10 minutes. Our largest database of car suppliers enables us to provide you a rental car in Bahamas at the cheapest rate ever possible. At rental locations in Bahamas we offer the following car sizes: mini, compact, economy, standard, premium and luxury. The following car types are available in Bahamas: Sedan, Hatchback, Jeep, Cabriolet, Coupe, Minivan and Minibus. The Bahamas have always had an aura of luxury, prestige and success. This is an upscale resort that is sometimes called “Switzerland in the Caribbean” because the Bahamas have not only many hotels, but also banks, office and business centres. As a rule, visitors are simply charmed by mesmerizing beauty of local nature, numerous landmarks and rich choice of entertainment, including most original and unusual ones. Tourists, who want to enjoy the silence and relax in pristine nature, are recommended to visit the following islands: Grand Bahamas, Andros, Bimini, Berry and Exuma. These islands are well-known among fans of scuba diving and underwater fishing. Some islands have aqua parks and swimming pools where visitors can swim with dolphins, watch shark feeding or simply enjoy a yacht ride along the coastline. 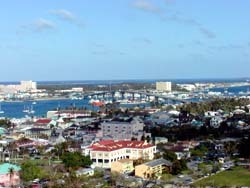 The capital of the Bahamas, Nassau, has developed tourist infrastructure. Guests are welcome to participate in various excursions. The local fortress is one of the most famous historic landmarks of Nassau. Built in the 18th century, the fortress has survived in excellent condition, and its halls still have the atmosphere of elegance and chasteness of previous centuries. The Queen’s Staircase is one of the most famous landmarks in the Bahamas. The staircase has 66 steps and leads to a beautiful observation deck that features magnificent views of the city and bay. The Parliament Square is the heart of Nassau. Here you will see a beautiful statue of Queen Victoria made of marble. The statue is the main decoration of the square, but there are also several historic administrative buildings there. Most of these buildings were finished in the beginning of the 19th century. These are the buildings of Royal Court, Administration of the Colony and Parliament. Charlotte Fortress is another important historic building and tourist sight. The fortress was built in 1788 and there are many legends and interesting stories associated with it. Without a doubt, the Bahamas are rich not only in historic places of interest. Atlantis Water Park will be a great choice for visitors who seek entertainment. The territory of the park is divided into 14 separated parks. There are artificial lagoons, underwater labyrinths, swimming pools and rides there. Guests, who cannot imagine their vacation without nightlife, bustling parties, night clubs and casinos, are advised to visit the Paradise Island. Tourists, who prefer sport activities, will definitely enjoy their visit to the Grand Bahama Island that is famous for its sport centres. There are several tennis courts, golf fields, football fields and basketball courts in Freeport town. Freeport is also famous for its markets and shopping centres. Before making a reservation, please read the rental conditions of your chosen car. This will help to avoid unpleasant surprises at the rental office in Bahamas. The damage to the car body, wheels and windows, caused in non-accident situation, is not covered by the CDW insurance package. These damages can be insured at the rental office in Bahamas, by ordering a complete coverage package.